Good news for the portfolio today, the oil major Total has made an offer for all shares of SAFT, the battery producer I previously wrote a post about. Under the terms of the deal, Total said it would pay €36.50 a share for Saft, representing a premium of 38.3 percent to its closing price on Friday. Total has earlier bought a Solar-Panel company and seem to be planning the full infrastructure for renewable energy. So instead of having the pleasure of holding this company over the years, we cash out early and can deploy our money elsewhere. The stock is trading close to the bid and there is little reason to think any other player would step in and outbid Total, so the position will be sold tomorrow. Even though S&P500 has recovered significantly from February lows and is almost back at all time highs, stocks globally still feel weak. Most of the stocks on my radar is far from all-time-highs, how come is that? Well first of all Europe is NOT back to all time highs, we need to go up +23% to break the April high of last year and Hang Seng needs to rally +40% to get back to the highs (although those highs were amplified by the China madness rally). Some of this dispersion between Europe and US lately is probably driven by the weakening of the USD against EUR. The other reason why it feels like “my” stocks are even more depressed is that the biggest recovery has been in sectors like Oil & Gas and Basic Resources (Mining etc). Which are sectors I disregarded from now for quite some time. Maybe it’s time to revisit both Mining companies as well as agriculture related investments. I for example still believe in the Uranium story, that I invested in about 10 years ago. Long-term, if the worlds want to get rid of coal, we can only go nuclear. 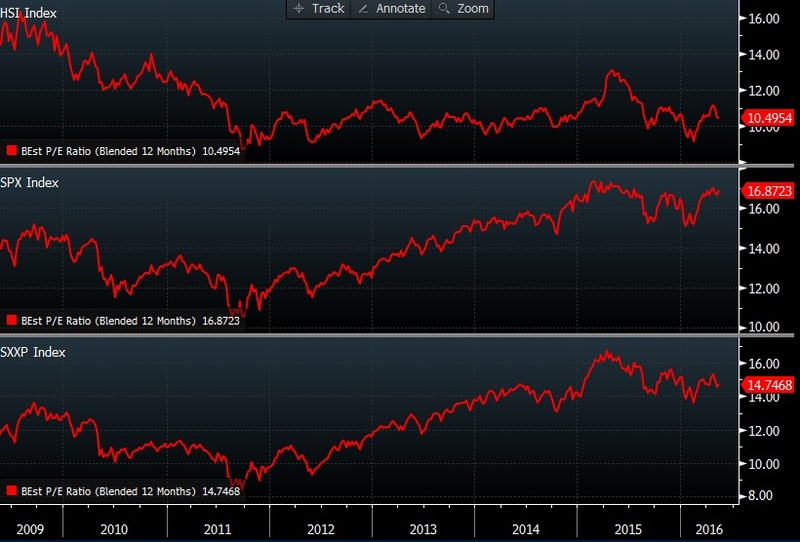 So looking at this metric, the conclusion is there is not much upside in US-stocks, Europe is somewhere in between and Hong Kong looks cheap. There is always more than meets the eye to these kind of figures though. 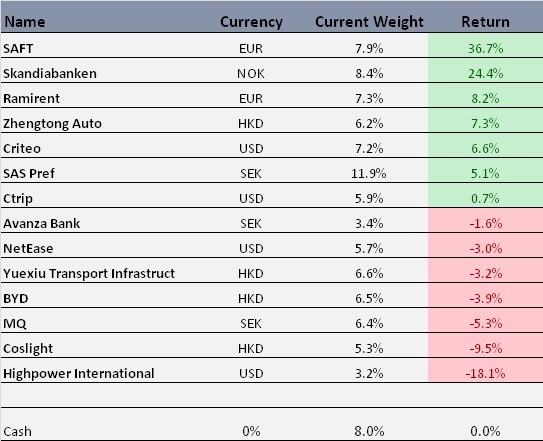 The HSI P/E is so low partly because the Mainland Chinese banks are big in the index and they have very low P/E:s. Anyhow I find more Value in Hong Kong and this discount in the Hong Kong stock market is one of the reasons why I keep allocating an overweight there. Although my bet on battery-related companies might be somewhat too high. My next investment will probably be in a Asian Insurance company.